Happy Friday everyone! After a couple of slow weeks due to the holidays, we are back and bigger than ever! Lots of news this week, so let’s get right to it. • Last month, we mentioned the Great Canadian Beer Expo, a travelling beer festival, would be coming to six different cities in the Maritimes, starting in late January. While we had never been able to get solid details or a beer list from them (which we had contacted them for several times, in hopes of doing a full write-up), we thought it was worthy of a quick mention on the blog. In the past week, thanks to some detective work begun by members of the Brewnosers Homebrew Club, it has been determined that the event might have been nothing more than a work of fiction dreamed up by a single man, Jonathan Brett. He had previously organized “Mud Immortal“, a fall event in St. John’s, Newfoundland, that came under fire for poor management, dangerous conditions, and not following through on promises of charitable donations. In the last couple of days, the events have “officially” been canceled, and people who have purchased tickets should have received information on how to get refunds. • On a happier note beer-festival-wise, we are looking forward to two legitimate and ANBL-approved events taking place this spring: the Fredericton Craft Beer Festival being held at the Fredericton Convention Centre March 8th, and the Saint John Beer Fest at Market Square April 5th. Tickets for both are still available, we hope to see you there! • As the initial launch of Red Rover Brewing Company gets closer, co-owner/brewmaster Adam Clawson has confirmed that the plan is to have up to four varieties of cider available when the Ciderhouse opens towards the end of the month. With a spring, summer, and fall cider pouring, along with a “surprise” variety, there should be plenty to satisfy the palates of cider fans in New Brunswick! Look for their ciders to be available for growler fills at their Ciderhouse location, as well as on tap at various bars/restaurants in the area. Check back here for more details, and keep an eye on the Ciderhouse Twitter page for the latest availability. 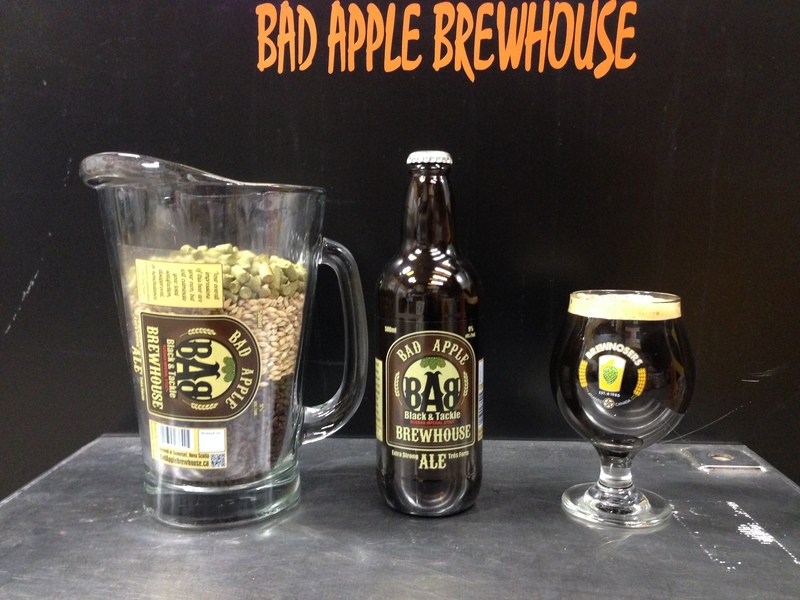 • It’s been a busy first two weeks at the Bad Apple Brewhouse in Somerset, NS. The first customers arrived mid-morning December 31st, eager to pick up the American Pale Ale from Atlantic Canada’s newest brewery, and the visitors haven’t slowed down since (even during the nasty weather last week). As promised, the Black and Tackle Russian Imperial Stout is being released Saturday, on sale in bottles and growlers at the brewery. This robust beer features a boatload of roast coffee and chocolate flavour and aroma, with a nice hop bitterness to balance it out. It weighs in at 9%ABV and 110 IBUs (calc). Look for it on sale in HRM soon. BAB-branded glasses join t-shirts and decals in the shop. At 20oz, they are a proper glass for a proper beer! Drop by today, the brewery hours are 3-8pm Mon-Thurs and 1-10pm Fri-Sun. • The Lunar Rogue Pub in Fredericton will be celebrating their 25th anniversary this year. For this special event, Picaroons is brewing up a series of seasonal beers that will be available exclusively on tap at the Rogue; the first beer should be pouring sometime during the week of January 27th. The style of beer has not yet been announced; however, they ARE looking for some help in naming it. If you think you’ve got a catchy title for this new beer, post it to the Facebook page of either Picaroons or the Lunar Rogue – if your entry is selected, you’ll win a Picaroons Draught & Dinner Party for six, valued at $300. Enter as many names as you like; deadline for submissions is next Friday, January 17th. We’ll keep you updated on details of the new beers as they become available! • The Pump House Brewery just tapped another new beer at their brewpub location in Moncton. Pompier à Vos Garde is in the style of Biere de Garde (meaning “beer which has been kept or lagered”), a farmhouse ale originating in Northern France. The style ranges from blond to brown; Pump House’s take is of the brown variety, and is brewed with 2-row, Crystal, and Carafa dark malts. Described by the brewery as being lightly hopped with “three distinctive hops”, the beer should have some fruity esters noticeable in the taste, and be quite smooth despite the 7% ABV. Get down to the brewpub before it’s gone! • Tomorrow, Jan. 11th, is Sir John A. MacDonald’s birthday, and the PEI Brewing Co. is celebrating with two separate events. First, there will be free live entertainment and birthday treats available at the brewery from 1 pm – 5 pm, along with brick-oven pizza and beer. At 8 pm that evening, the doors will open for more music, food and beer, with live bands starting to play at 9 pm. Cover for the evening session will be $10 per person. While there are no one-off beers planned for the event, all of the regular PEI Brewing Co./Gahan beers will be pouring, with special emphasis, of course, on their Sir John A’s Honey Wheat Ale. • Speaking of the PEI Brewing Co., they’re partnering with PEI 2014 to help celebrate the province’s 150th anniversary, or sesquicentennial (and yes, I did have to re-check the spelling on that word). The brewery is releasing a Fathers Commemorative Beer Pack, a 4-pack of some of their regular-release beers that have been re-branded and re-labelled for this packaging. Included will be Blueberry Ale (re-named 1864), Coles Cream Ale (Premier George Coles; note that this beer was previously only available on tap), Iron Bridge Brown Ale (Colonel John Hamilton Gray), and, of course, Sir John A’s Honey Wheat Ale. Four-packs should be available at PEILCC stores and at the brewery today; look for them in New Brunswick, Newfoundland and Ontario in the coming weeks. • Today, the Stubborn Goat Gastropub is starting up a new series, Cask Fridays. They want to showcase this special way of serving beer that is especially friendly to one-off or unique twists on regular beer (sometimes with added fruit, whisky, oak, or other interesting ingredients). Today’s first event will feature Garrison Brewing, with cask-conditioned versions of their Winter Warmer and Spruce Beer, tapped at 4pm. The Goat has also put out the call for other breweries interested in taking part in the first of many events; contact Geir to be a part of it! • Speaking of Garrison, were you considering entering the 2014 Garrison Home Brew Off? If you need a little push, Steven Haynes from Noble Grape will be at Garrison from 10am-2pm on Saturday the 18th doing an all-grain brewing demonstration of a Weizen (this year’s competition style). It’s the perfect opportunity for home brewers of all experience levels to drop by and learn about brewing this style of beer. Entries are due Feb 20th, plenty of time to brew, but don’t wait much longer! Entries can be dropped off at Garrison or your local Noble Grape. • Also in Garrison news, they are partnering with a University of King’s College professor to bring the students of his Brewing Science course some special experiences this term. They will be hosting lectures (at the brewery) and leading some short seminars (Cask Ale and sensory workshops), ensuring a new generation of good beer lovers. Where were these courses when we were in school!? I wonder if I could audit it? • Next Saturday, January 18, Halifax’s Stillwell Beer Bar is hosting a tap/cask takeover featuring Nyanza’s Big Spruce Brewing and Shelburne’s Boxing Rock Brewing. It is a closed event, from 12-5pm, requiring a ticket (available at the bar or by email), after which the bar is open to all. Your $10 will get you first crack at some great beer and food, a special glass to take home, and a drink ticket. From Boxing Rock: Many Hands Pale Ale (their collaboration with Halifax’s Bridge Brewing, and the last keg around! ), Hunky Dory Pale Ale, Temptation Red Ale, Crafty Jack English Brown, U-889 RIS with Vanilla beans, Vicar’s Cross IIPA. From Big Spruce: Tim’s Dirty (recent homebrew competition-winning IPA), Blackout Conundrum (brewed over two days when the power went out at the brewery), Organic Conspiracy IIPA (collaboration with Crannóg), Regatta Red (first time on tap at Stillwell), Bitter Get’r India Black IPA, Kitchen Party Pale Ale and Cereal Killer Oatmeal Stout. And the brewers from both breweries will be there to talk shop and answer all of your questions. • Monday, January 13th, Halifax brewpub Rogues Roost is hosting their second Brewmaster Monday event. For $15, attendees will receive a sample of all six beers currently on tap (including their Blueberry Wheat, just released this week), and have a chance to chat with brewer Jake Saunders about the process of brewing, from recipe development to brewday to serving. These events serve as a great way to introduce folks to the art and great taste of craft beer. Contact Husky Communications on Twitter or Facebook to grab tickets. This edition of the event is almost sold out, but have no fear, they will be doing it again on January 27th! • And if you’re looking for even MORE beer events in Halifax, the Rockbottom Brewpub is planning a series of monthly beer dinners, with the first being held on January 27th. Starting at 6 pm, the meal will consists of three courses, paired with three separate Nash beers. Tickets are $30; the menu and beer list will be posted on Rockbottom’s Facebook and Twitter pages soon.